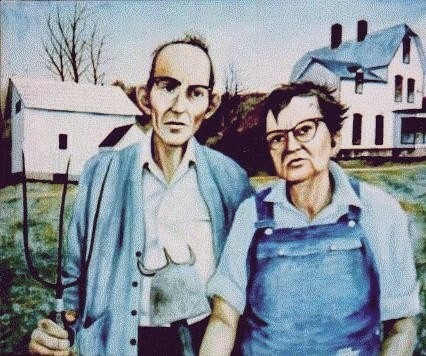 © American Gothic (Revisited) (20"x24" oils on stretched canvas) One of the older paintings in my collection, this was done about fifteen years ago when I was working extensively with transparent oils on "toned" canvases. The overall bluish-gray effect is a result of this technique. 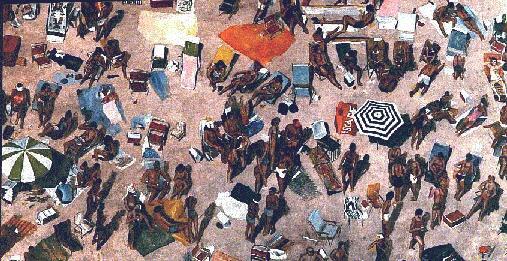 The inspiration for this work goes without saying, however its modern "updating" is meant to be as accurate as it is tongue-in-cheek. Notice who wears the bib overalls this time around. 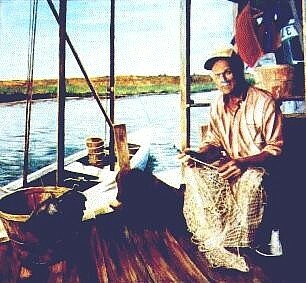 Fisherman's Friend© (30"x30" acrylic on stretched canvas) This is one of two paintings I did involving male vocations. 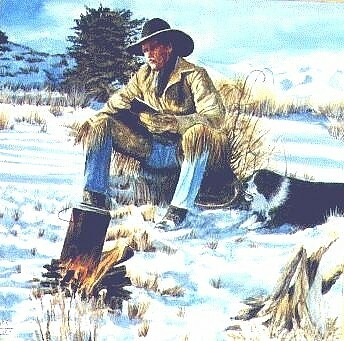 The other one was entitled Cowhand's Friends and features a man warming himself by a morning campfire with his trusty "friend" lying beside him watchfully. Both paintings are about the same size thought they look nothing alike. It may be seen below. Cowhand's Friends © (30"x30" acrylic on stretched canvas) This is one of two paintings I did involving male vocations. The other one was entitled Fisherman's Friend and featured a man mending his nets with his trusty "friend" lying beside him watchfully. Both paintings are about the same size thought they look nothing alike. I hope to do others along this line in the future. Mary Go Round © (48"x36" acrylic on stretched canvas) I've always had a weekness for what's called genre painting. I've often been compared to Norman Rockwell in that regard though I make no pretense about matching his work in any way. I've tended to limit my genre work to single individuals having the time of their lives. That pretty well sums up this lovely lady--never too old to feel young again. One has the feeling she hasn't ALWAYS ridden side-saddle. 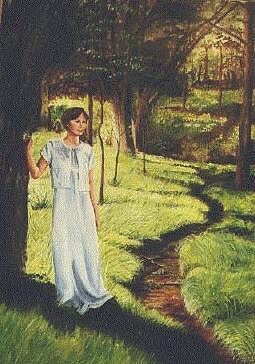 Meadow Magic©' (20"x30" acrylic on stretched canvas) Some twenty years ago I was the high school yearbook advisor where I teach and this lovely young lady was the homecoming queen. As was customary at the time, she was presented in a full-page, full-color layout in the book. This painting was based upon the color photography for that page, done by a long-time photographer friend of mine, Mel Samples. The scene was shot in a sometimes rather swampy meadow which has since been made into a lovely city park. Escape! © (18"x36" acrylic on canvas) Not too far removed from the non-traditional still-lifes exhibited on the opening page, one might call this a non-traditional non-still-life. It's another attempt on my part to bridge the gap between the art lay-person and the trained (and perhaps somewhat jaded) eye of the art connisseur. April Fifteenth Again © (30"x30" acrylic on stretched canvas) Several years before painting this one, I did a similar work on the same theme. I called it simply April Fifteenth. It depicted a man in bed, his wife asleep beside him, a cat curled up at his feet, and all over the bed were strewn forms, receipts, an old adding machine, and all the other IRS wastepaper one needs to help support the government for a year. This poor guy seems a little more organized, but no less perplexed and procrastinated. At least his son and the dog have stayed up to keep him company in his misery. © Nimble Thimble (16"x20" acrylic on stretched canvas) I guess the hand kind of makes this a still-life with the "human touch" so to speak. 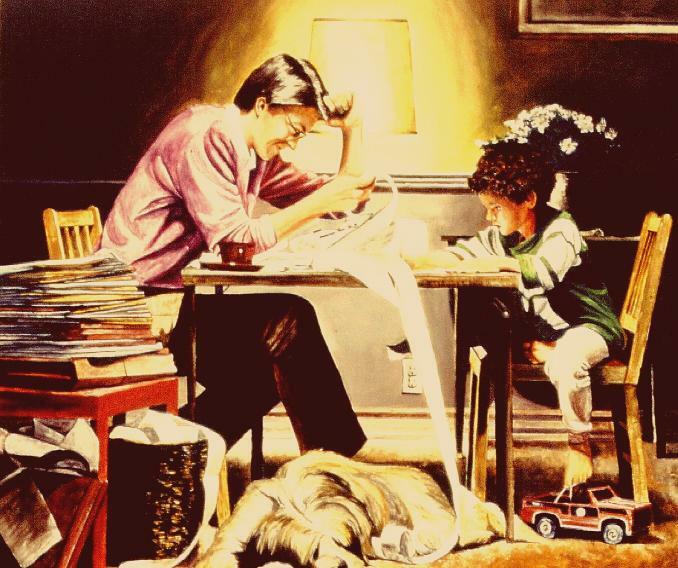 Perhaps because of the nostalgia, this painting has long been a favorite at art shows. If I recall, it's also won a ribbon or two. Unframed. . . . . . . . . . . . . . . . . . . . . . . . . .$195.